← How to set docPrint as default printer? Whether I can convert GIF image to PDF file? Yes, you can convert the GIF image to PDF file but animations will disappear. In the PDF file, it only keeps the first frame of the flash or it will convert the flash to many PDF pages which show each frame in each page. Because the GIF image is made up by many different parts. GIF image is a bit-mapped graphics file format used by the World Wide Web and many BBSs. GIF supports color and various resolutions. It also includes data compression, but because it is limited to 256 colors, it is more effective for scanned images such as illustrations rather than color photos. Then I will show you my way of converting a GIF image to PDF file. Take a gif image for example. 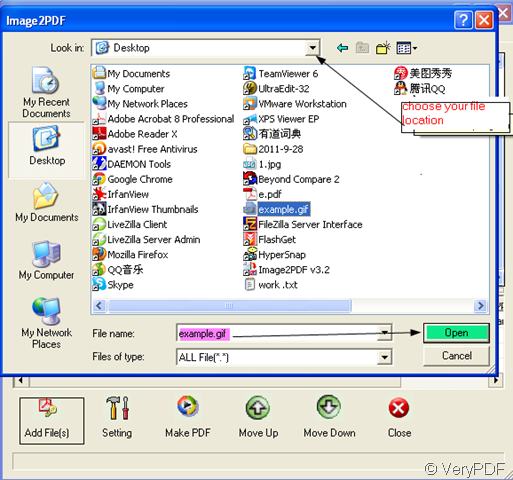 I will add this file to Image2PDF v3.2 and convert it to PDF file. When you save the “ img2pdf.exe” successfully then let it run your computer. You will enter its interface, please add your file to Image2PDF. I will add this file to it too. Two ways for you to add files. 1,by draging it to the blanks 2,click “Add PDF” button. I showed you the second way of adding file in the follow picture. This way is appropriate for those files which are not on the desktop and all your files needed to be converted in a folder then you can choose all of them once. Then please choose the limiting conditions for your newly produced PDF files at “ Setting”. Say you want to add Bookmarks for your PDF files. Please choose “ Bookmarks” column. 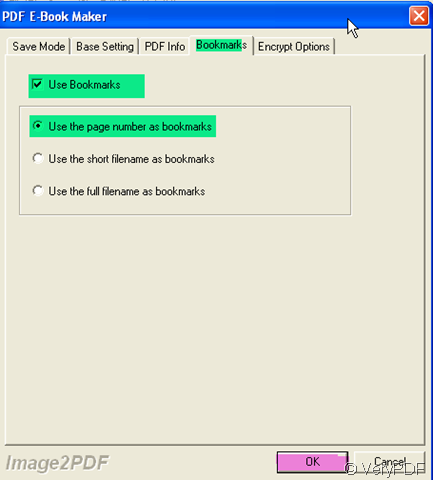 There are three options here: you can use the page number, short file name or full filename as your bookmarks. Please choose one of them then click “OK” button. If you do not have other restrictions, you can convert it now by clicking “ Make PDF”. Then name the new PDF file and save it in a folder. It takes a few seconds to finish the converting. 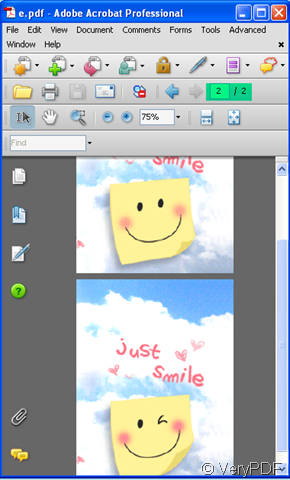 In the folder, there will be a new PDF file with your GIF image content. But it does not have animations. The newly produced PDF file has two pages which have one frame in each page. How to call PDF Split-Merge application from VB.NET code?